NB: A traditional nage is a broth flavoured with white wine, vegetables, and herbs, in which seafood is poached. For the nage, place a saucepan over a medium-low heat to heat up, then add the lemon zest. Heat for a minute to allow the lemon zest to release its natural oils and then pour in the vegetable stock. Bring to the boil, lower the heat and simmer for 5 minutes. Set aside to cool. Once cooled, add the lemon juice. To cook the vegetables for the nage, blanch the asparagus and peas in boiling salted water for a few minutes until just tender, then drain and refresh in cold water; drain and set aside. Heat a little rapeseed oil in a saucepan and add the shallots and garlic. Sweat for 1 minute, without colouring, then add the carrots and fennel. Continue to sweat for another 2 minutes and then add the nage stock. Simmer until the carrots start to soften slightly, about 5 minutes. Now add the cream and simmer for a couple of minutes. Season with salt and pepper to taste. To cook the fish, heat a large non-stick frying pan and add a drizzle of oil. Once the oil is hot, place the fish in the pan, skin side down, and cook for 2 minutes or until the skin is golden and crisp at the edges. Flip the fish over and take the pan off the heat. The fish will continue to cook in the residual heat while you finish the nage. To finish the nage, add the blanched asparagus and peas, spring onions and herbs to the pan and simmer for 1 minute. Ladle the vegetables and nage into 4 warmed soup plates. 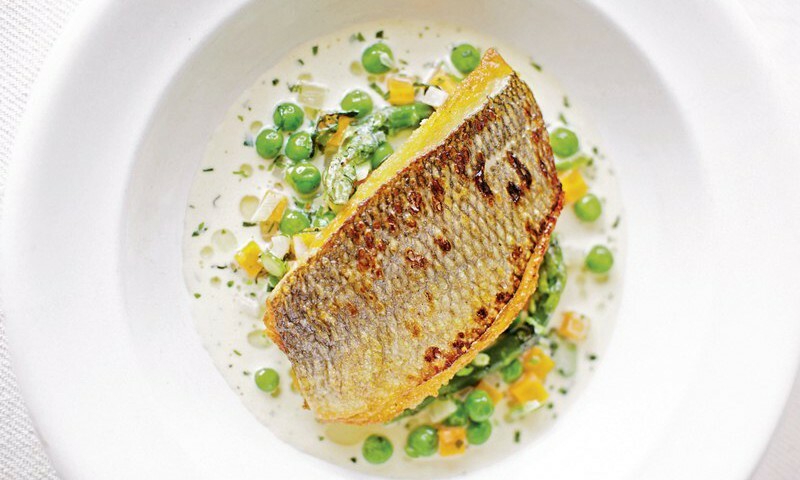 Top with the pan-fried fish, placing it skin side up, and drizzle the lemon oil around. Serve at once.